Simore DualSim Infinite adapter is the latest generation of internal device enabling you to install two SIM cards in one Mini SIM format mobile phone. Successor of the DualSim Platinum Plus, this dual SIM card adapter has been created for users looking for an High class product that include the latest Simore technological innovations. For Simore Dual SIM card Infinite, our engineers have developed the "Bullet Injection" technology. This new "Bullet Injection" technology strengthen and optimize the contact points between the SIM cards and the Simore DualSim Infinite device, ensuring an optimum connection. Simore DualSim Infinite adapter incorporates our SIM cards software algorithms recognition technology and is compatible with all Mobile Telecommunication operators. The operating environment for PDAs and mobiles is constantly evolving. (iPhone OS, Android, Symbian, Bada, RIM, Garnet, Access Linux platform, LiMo, Meego, Mobilinux, WebOS, etc...). The performance of Simore Dual SIM card Infinite has been significantly optimized for the iPhone, Android, Symbian, Bada and other mobile's OS. The Dual SIM card adapter Infinite allows users to take full advantage of Internet access and video connections via 4G - LTE - 3G networks - UMTS - WCDMA - HSDPA (High Data transfer speed). The Dual SIM card system Infinite version requires the cutting of your SIM cards. Our system is reversible. We provide in every pack two recovery tools that enable you to restore your SIM cards to their original form and place each of them into two separate phones. Choose quality and enjoy a top-of-the-range product. Optimization of contacts with the "Bullet Injection" technology. 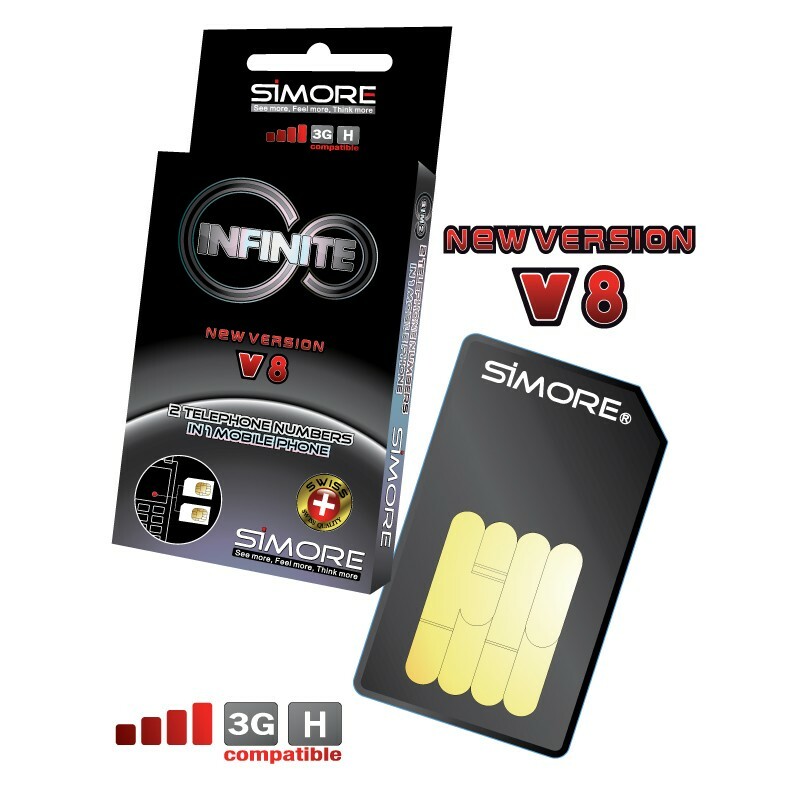 Simore Dual Sim card Infinite V8.0 includes an encrypted SMS function which allows you to send and receive confidential information. To use the "SMS encrypted" the mobile phone must support the storing or copying of received SMS messages in the SIM card memory.